Precious metals tumbled on Thursday as the U.S. dollar rallied. Gold futures ended at their lowest price in just over 6 years while silver neared a more than 6.3-year low. Gold for February delivery declined $27.20, or 2.5%, to close at $1,049.60 an ounce on the Comex division of the New York Mercantile Exchange. The settlement was the lowest since Oct. 30, 2009 when the yellow metal ended at $1,040.40 an ounce. 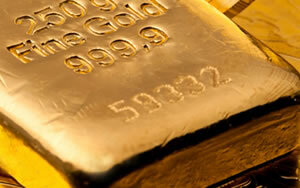 "Gold and silver prices ended the U.S. day session sharply lower Thursday. A very strong rally in the U.S. dollar index on this day put sharp downside price pressure on the precious metals markets," Jim Wyckoff, a senior analyst at Kitco Metals Inc., said in a report. " The other key ‘outside market’ was also in a bearish posture for the metals today, as crude oil prices were lower and are back down near their recent contract and multi-year lows." Gold prices ranged from a low of $1,046.80 to a high of $1,072.70. On Wednesday, they tacked on $15.20 or 1.4%. Silver for March delivery fell 54.5 cents, or 3.8%, to settle at $13.703 an ounce. The price is a half penny above Monday’s close when silver ended at its lowest level since July 30, 2009. Silver prices traded from $13.67 to $14.23. They rallied in the previous session by 47.8 cents or 3.5%. January platinum lost $31.30, or 3.6%, to $844.70 an ounce, ranging from $842.40 to $883.90. Palladium for March delivery gave back $14.50, or 2.5%, to $557.45 an ounce, trading between $551.25 and $572. Gold declined $25.85, or 2.4%, to $1,049.40 an ounce. Silver gained 34 cents, or 2.5%, to $14.08 an ounce. United States Mint bullion sales were unchanged for a second day in a row. Expect only small movements through the next few weeks with all the agency’s silver coins and most of its gold coins sold out. New 2016-dated editions do not launch until Jan. 11.